Intergraph CAESAR II определяет напряженно-деформированное состояние трубопроводов и поведение конструкций по международным нормам и стандартам. Являясь эталоном для сравнения, программа стала мировым стандартом прочностного анализа трубопроводных систем. Ensuring your plant’s piping systems adhere to international codes and standards plays an integral role in keeping your plant operational. Intergraph CAESAR II software makes it easy to input and display all the data needed to accurately define a piping system analysis model. It evaluates the structural responses and stresses of your piping systems to international codes and standards, and enables you to access and modify, if necessary, input element by element or globally. 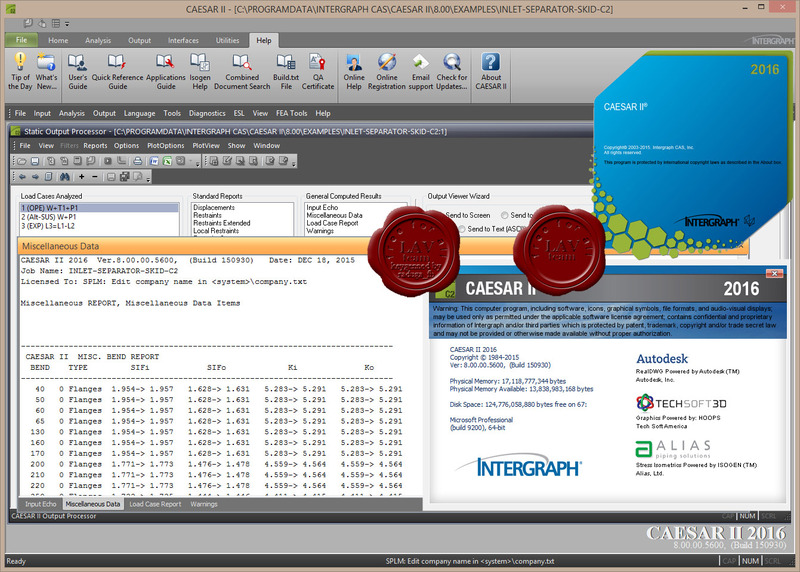 As pipe flexibility and stress analysis software, CAESAR II makes quick work of developing analysis models while clearly indicating areas of concern via color-coded stress models and animated displacements for any stress load case. Included are tools and wizards to help you create expansion loops or view plant models, removing the guesswork from producing accurate analysis and recommending practical design changes.